30th Anniversary of the bestselling AutoCAD reference - fully updated for the 2018 release. 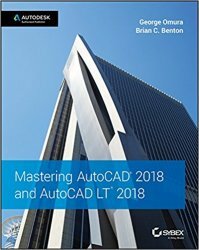 Mastering AutoCAD 2018 and AutoCAD LT 2018 is the complete tutorial and reference every design and drafting professional needs. Step-by-step instructions coupled with concise explanation walk you through everything you need to know about the latest AutoCAD tools and techniques; read through from beginning to end for complete training, or dip in as needed to for quick reference—it's all here. Hands-on projects teach you practical skills that apply directly to real-world projects, and the companion website features the accompanying project files and other bonus content to help you master every crucial technique. This new edition has been updated to include the latest AutoCAD and AutoCAD LT capabilities, so your skills will transfer directly to real-world projects. With expert guidance and a practical focus, this complete reference is your ultimate resource for mastering this powerful software.